Here’s the newest installment of Kristen Nelson’s series about types of beginnings that often don’t work. #4) Your novel opens with a lengthy passage of “talking heads” dialogue. Here’s what fascinates me: The openings we suggest that you avoid actually evolve out of a writer’s good intentions. In this case, writers know that starting with dialogue can be a very dynamic way to open a story. Dialogue is inherently more energetic than a description-of-the-setting opening, and if done well, a dialogue-heavy opening can reveal a lot about character(s). Just so we’re clear, we’re not suggesting that you ax every bit of dialogue in your opening. The problem arises when an opening provides only dialogue to the exclusion of all other narrative elements. Interesting! Yes, I would think that would be hard to pull off. If anyone ever does pull it off, it seems to me it might be in a hard-boiled detective type of story. That’s not a genre I have ever read a lot, but it seems to me you often get a lot of short sentences and with a lot of dialogue, often with only a few dialogue tags. If anybody can think of a real-world example where someone pulled off this kind of talking-heads opening, let us know! Now, if you pushed me to pick one element I think needs to be emphasized in the opening, I would go for setting almost more than anything else. The way the author handles the setting also establishes the tone, provides context, and generally contributes to characterization as well. Or so it seems to me. 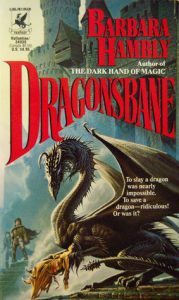 I always reach for Dragonsbane by Barbara Hambly to illustrate a really good story beginning that sets the protagonist (and thus the reader) firmly in the world right from the first sentences. Also, that’s just a really good book! I’m reading Dragonsbane right now, and it’s filled with excellent writing that I’m trying to learn from. And, I agree, it’s a fantastic opener. Glad you agree! I found a handful of really good openings (well, I think they’re really good, anyway) that I now pick up over and over whenever “starting your novel” comes up. Um, I will just add that imo the Dragonsbane sequels were not as good as the first book. YMMV, of course, but I don’t think I’ve ever bothered to re-read them, whereas I definitely enjoy re-reading Dragaonsbane. I would love to hear more about the books you use for those purposes. Similarly, I’m reading ‘The Floating Islands’ for the first time (sorry–late to the party) and making notes where I see descriptions I want to remember for the sake of my own craft. I was reading (well, listening to) Thrones, Dominations by Dorothy L. Sayers and Jill Paton Walsh. DLS wrote the original, incomplete version and JPW finished and revised the ms. It was fascinating (from a writerly pov) to try to untwine the story and guess who wrote which part. I got to recognize a JPW scene because she would always, probably-couldn’t-refrain-even-at-gunpoint, always start a scene with unattributed dialog, and then fill in the details of who was speaking, where they were, who they were with. It was so overdone that I can’t stand that technique any longer. I enjoyed the comments below the post which all made very different stories and settings out of that talking heads opening. Object lesson in why the writer needs to put in more than just dialogue. Also shows how many ways the same dialogue can be spun. Another book I point to for a great beginning — that seems to break rules — is The Breach by Patrick Lee. You know how you’re not supposed to start with your protagonist waking up or driving somewhere or being all introspective . . . Lee does all of that in a very effective beginning. Warning, the book is really hard to put down, so you may not want to start it until you’ve got time to read it! I admire the beginning of Sunshine by Robin McKinley. She starts off with this very normal-seeming world and then takes a hard left into weirdness. If you don’t like the protagonist’s voice, the story won’t work for you; if you do, then it’s a wonderful book.